Green Mole (Pipian Verde) is the perfect introduction to the wild world of mole sauces (pronounced mo-lay). Moles have a rich, satisfying flavor that you won’t find anywhere else on the planet. Unfortunately, sometimes that means they come with ingredients lists a mile long. Green Mole, on the other hand, gives you a tasty glimpse of the potential these sauces have without keeping you in the kitchen the whole day. I think it’s easiest to buy them hulled (as pictured above), but sometimes you’ll see them sold with the shells on. 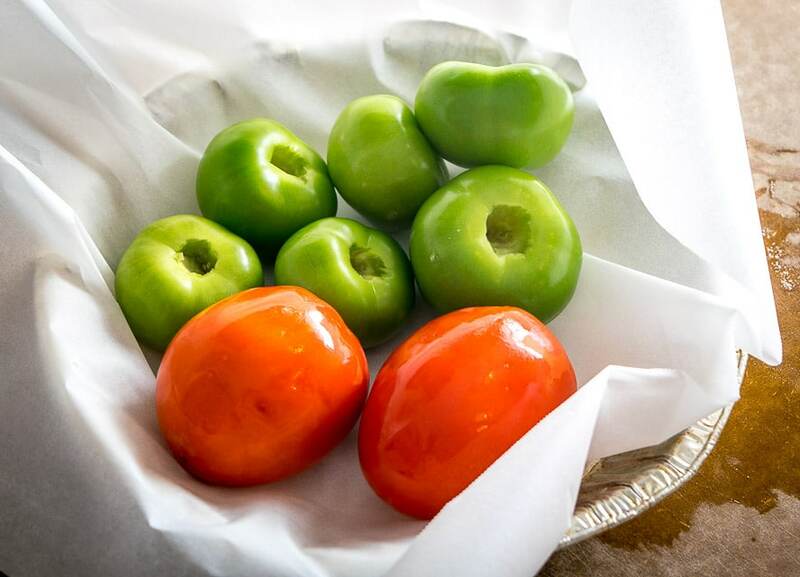 You’ll get an upgrade in flavor if you roast them first so we’ll start with that. 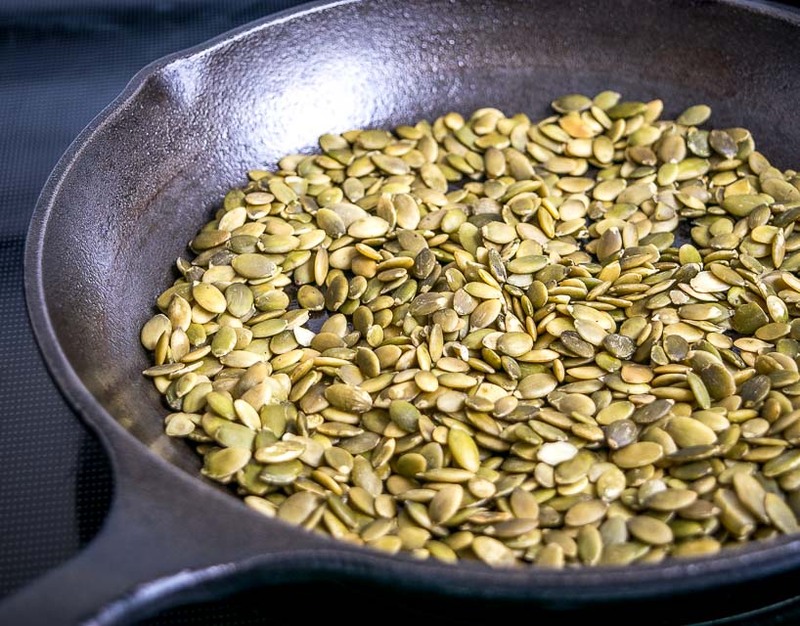 Add 1 cup pepitas to a dry skillet on mediumish heat. Give it a whirl and take a taste. This mixture is a good Mole Rep, offering you a hint of some of the heartier flavors you’ll find in mole sauces. 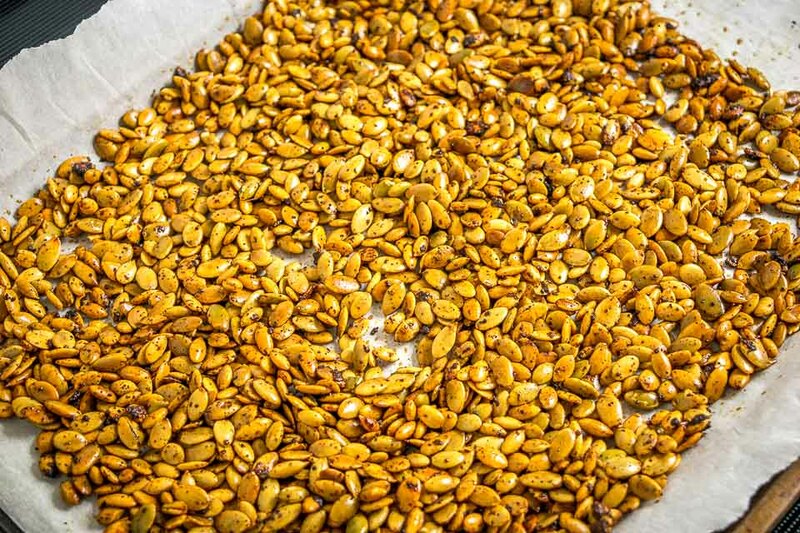 And while nuts and seeds might not be at the top of your list when making Mexican at home, when you add these flavors to traditional Mexican ingredients you get something truly unique. Note: While the pumpkinseeds are roasting, put some tomatillos in a 400F oven. You’ll need tomatillos for the Green Mole, and I’m serving it up with some Arroz Rojo so we’ll toss in some tomatoes as well. The Arroz Rojo is optional though; I’ll put instructions for it in the recipe box below, or you can see a post on it here. There’s an extended simmer on the horizon so it’s not crucial to roast the tomatillos all the way; I usually just toss ’em in a 400F oven until I need them. Combine well and take a taste for heat level. Keep in mind that this will get diluted a bit further with some stock, so I usually make this mixture quite sharp. 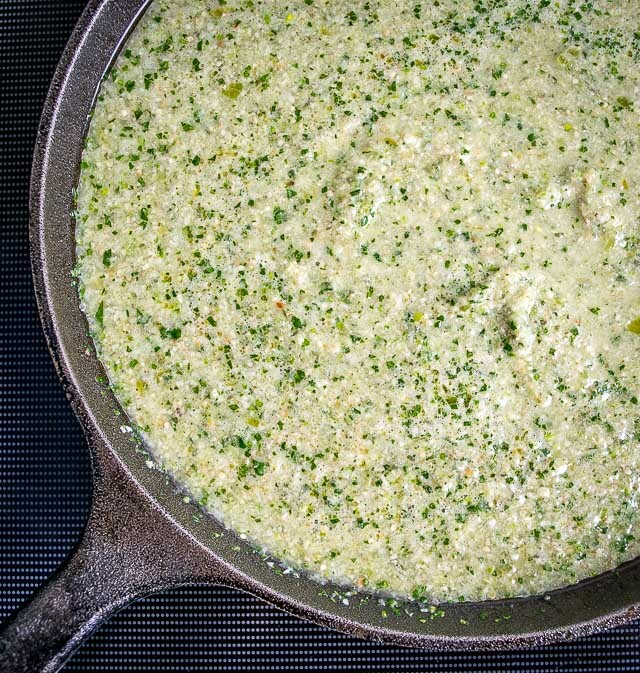 It’s already got great flavor, and while it’s tempting to eat it straight out of the blender, you’ll get a richer sauce if you let this simmer and reduce down for 20-30 minutes. Add a dollop of oil (or lard) to a saucepan over mediumish heat and add the sauce along with another cup of stock. This will need about 30 minutes to reduce down to a thicker consistency. You can partially cover it to get there quicker. 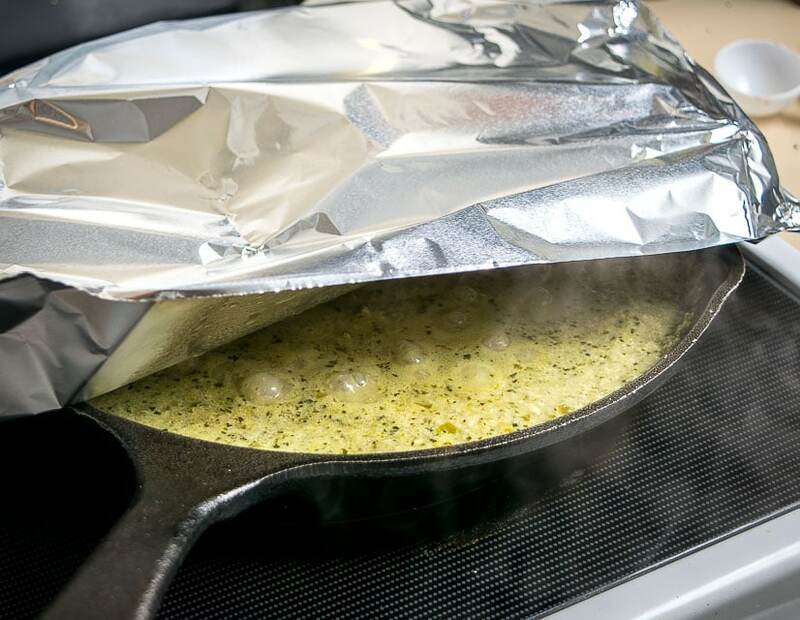 I don’t have a great lid for this cast iron pan, but some loosely attached foil works just as well. I usually turn the heat down to medium-low so that it bubbles quietly. 20-30 minutes later it will have reduced down to the point where it will cling to your spatula. Take a final taste for seasoning; I added another generous pinch of salt to this batch (so that is approx. 1 teaspoon total) but keep in mind that I used some unsalted homemade stock. If you’re using store-bought stock it will already have sodium in it and you won’t need to add as much salt. Green mole seems to work best with lighter grilled meats. You’ll frequently see it paired with chicken, turkey, pork chops, and sometimes even fish or shrimp. 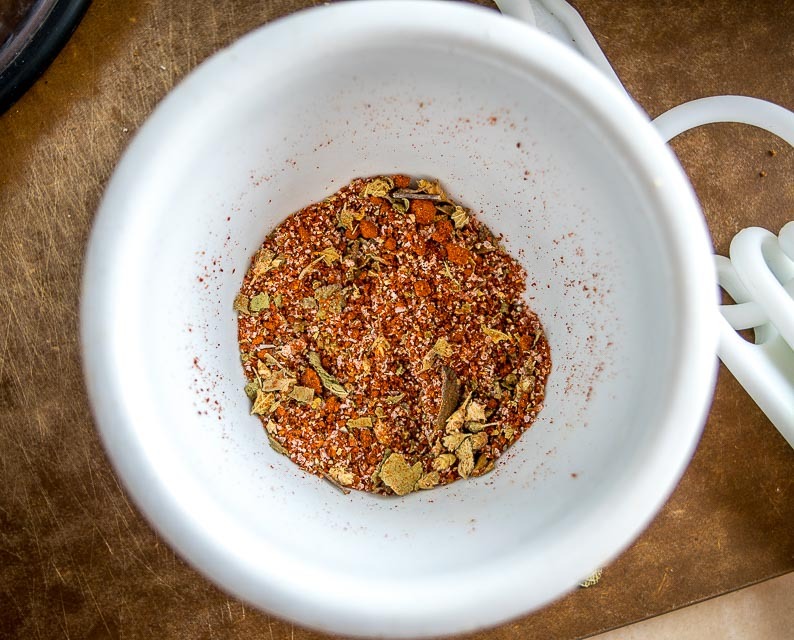 This batch is served up with seasoned chicken breasts and it is delish. The sauce already has loads of flavor so don’t sweat the cookery of the meat too much. You can get by with the simplest of meats and still end up with a great meal. I’ve also been experimenting with brining the chicken breasts first. This is definitely optional but something to consider if you want to juice up your chicken. There’s about 1/4 cup of salt in that pic above. Sound like a lot? Keep in mind that only a small portion of the salt will be retained by the chicken. 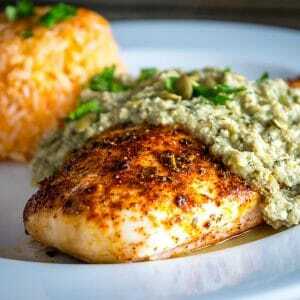 You’re left with some of the juiciest, most flavorful chicken breasts you’ll ever come across. For realz. Like most things in the kitchen, I no longer worry about making an exact science out of the brining step. Sure, 30-60 minutes would probably be ideal for it to properly brine, but I usually just toss the chicken in some salted water and pull it out when I need it. Even a simple, no-worry approach like this can drastically improve your cut of meat. If brining, be sure to pat the chicken dry before adding the seasoning to it. I usually melt some butter in a casserole dish, rub the dry chicken breasts in it, and then load them up with the seasoning. These will need about 20 minutes in a 400F oven to fully cook — about the same time that your mole sauce will be simmering. You can either take a peek inside to confirm they are no longer pink, or you can use a meat thermometer and confirm they are 160F in the thickest part of the breast. But make no mistake, it’s the Green Mole that’s the star of the dish here. Everything else is just a bonus. Drench the chicken in plenty of the sauce and you’ll be an instant convert. See, that was easy right? You really do get enormous return with this Green Mole sauce. Give it a try sometime, it’s the perfect example of the rich, complex flavor that mole sauces can generate — without the mile-long ingredient list. 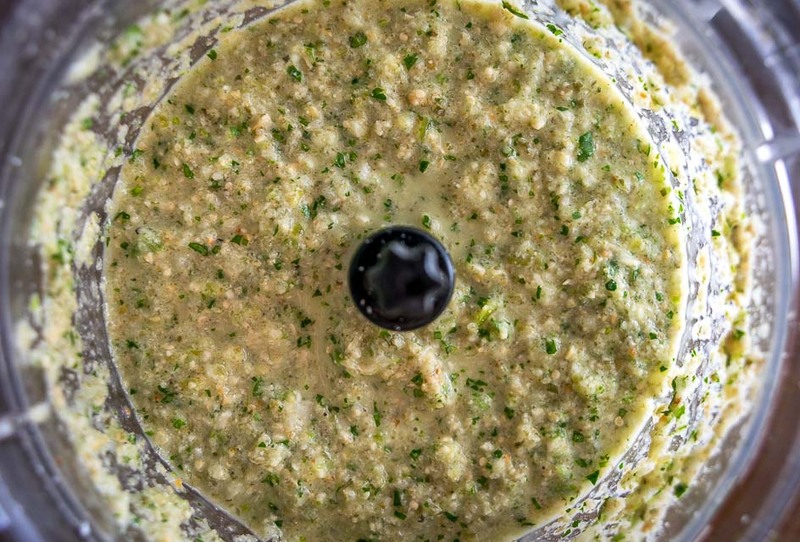 This is a delicious Green Mole sauce that works wonders on grilled meats. 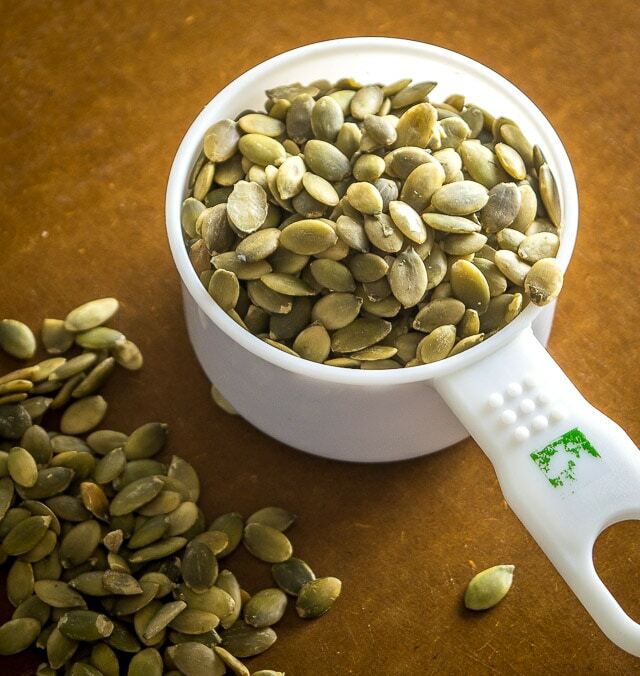 You'll need some pepitas (pumpkinseeds) to make the sauce -- and don't forget to roast them first. So good! Add 1 cup of pepitas to a dry skillet over mediumish heat. Let them roast until they are popping and turning golden brown, 4-6 minutes, stirring regularly. 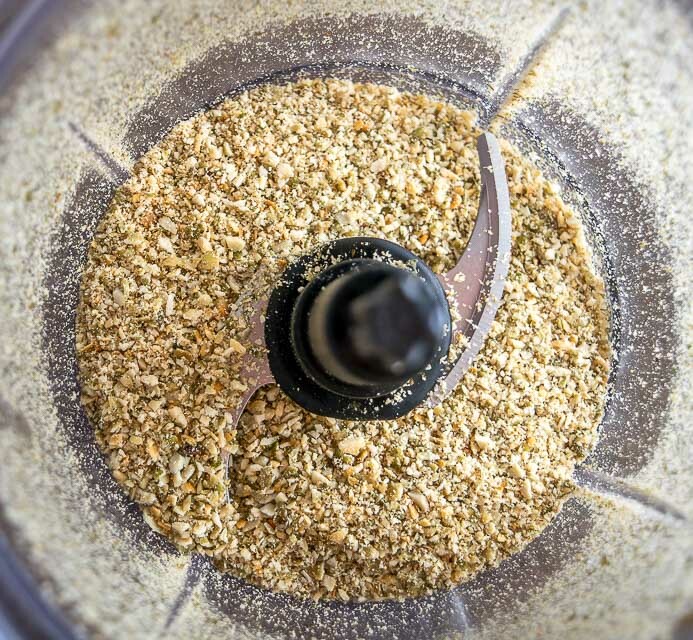 Add the pepitas to a blender or food processor along with 1/2 teaspoon salt, freshly cracked black pepper, a pinch of cumin, and a pinch of ground clove. Combine well. 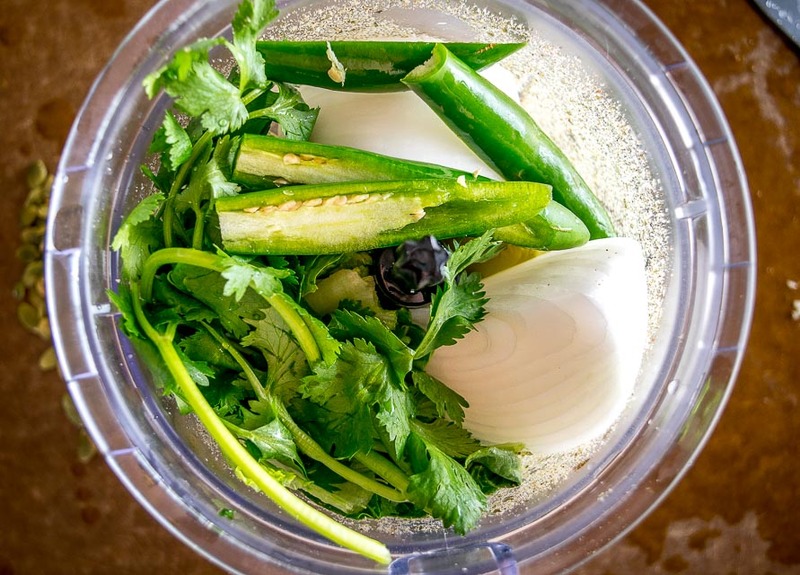 Add the roasted tomatillos to the pepitas mixture, along with 2 serrano peppers (de-stemmed), 1 cup spinach leaves (or 2-3 Romaine lettuce leaves), 1/2 onion, 2 garlic cloves, 6-8 sprigs cilantro, and 1 cup stock. Combine well and take a taste for heat level, adding more serrano if you want. Heat a dollop of oil (or lard) in a saucepan over medium heat. Add the sauce from the blender along with another cup of stock. Partially cover and simmer for 20-30 minutes or until it has reduced considerably, stirring regularly. I usually reduce the heat to medium-low while it simmers so that it bubbles quietly. If you're making Arroz Rojo, add a dollop of oil and 1 cup rice to a saucepan on medium heat. Stir and cook until the rice starts to turn opaque and brown (a few minutes). Meanwhile, add 1/2 onion, 1 garlic clove, and 1-2 roasted tomatoes to a blender. Pulse blend until smooth. You can add a few tablespoons of the stock if it won't blend at first. Add blender mixture to the rice. Saute for a couple minutes until heated thoroughly. Add 2 cups of stock and 1/2 teaspoon salt to the rice. Stir well. Bring to a light boil and then reduce heat to a low simmer. When all the liquid is absorbed (15-20 minutes) set aside and cover, letting it rest in its own steam for a few minutes. Salt to taste. You can use any seasoning you want for the chicken. 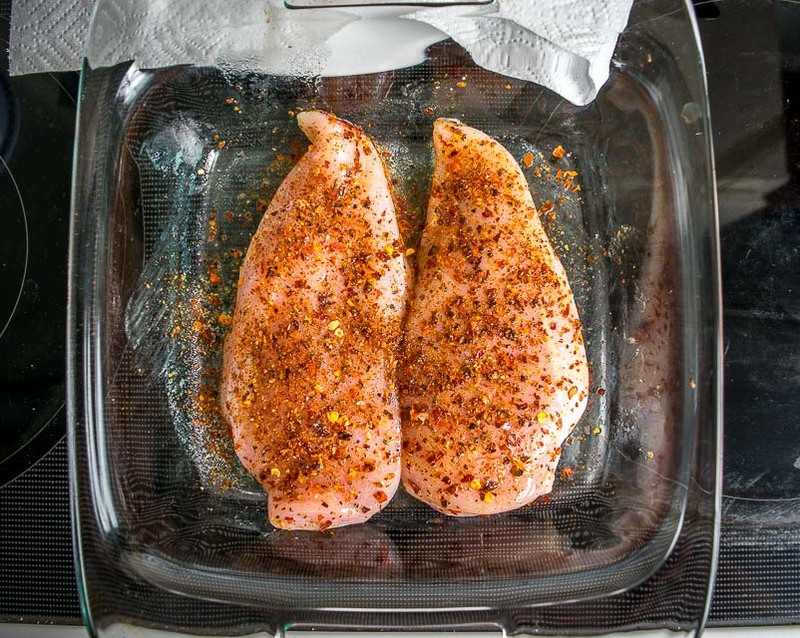 For this batch (2 chicken breasts), I used: 1 teaspoon chili powder, 1/2 teaspoon Mexican oregano, 1/4 teaspoon garlic powder, 1/4 teaspoon salt, and freshly cracked black pepper. I usually put the chicken breasts in the oven when the Mole starts to simmer. 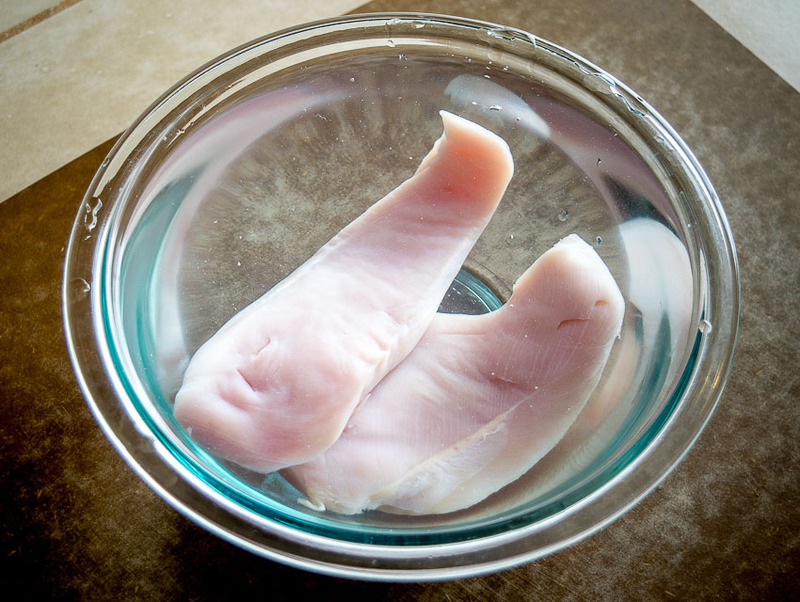 Remove the chicken from the brine and pat them dry. Melt 1 tablespoon of butter in a baking dish. Rub the chicken breasts in the butter and coat them generously with the seasoning mixture. Bake for 20 minutes or until the internal temp is 160F. Take a final taste of the Green Mole sauce before serving. I added another generous pinch of salt to this batch but keep in mind that it will depend on which stock you use. Serve immediately. 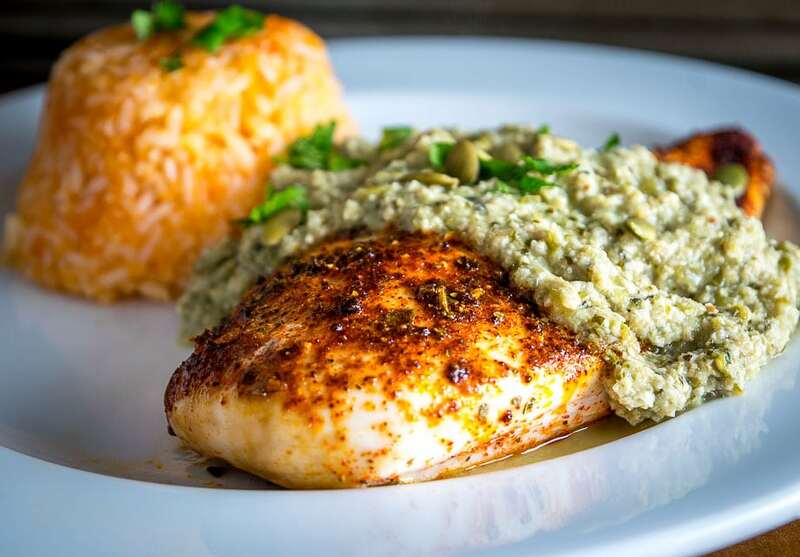 Each plate gets chicken, plenty of the Green Mole, and a serving of Arroz Rojo. Store leftover Mole in the fridge in an airtight container where it will keep for a few days. 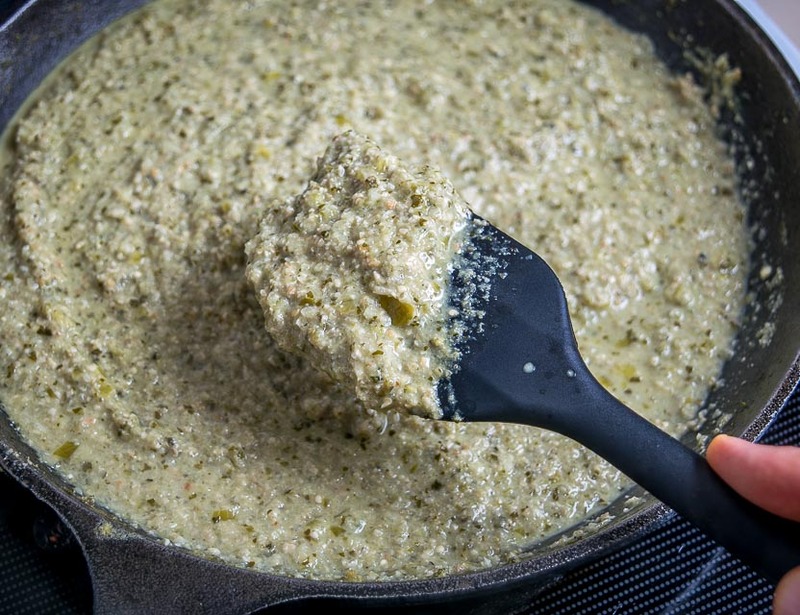 You can substitute jalapenos for the serranos and still get a great result. I usually twist off and discard the bottom, thicker part of the cilantro stems, but keep the upper stems. A typical brine ratio is 1 cup of salt per gallon of water. 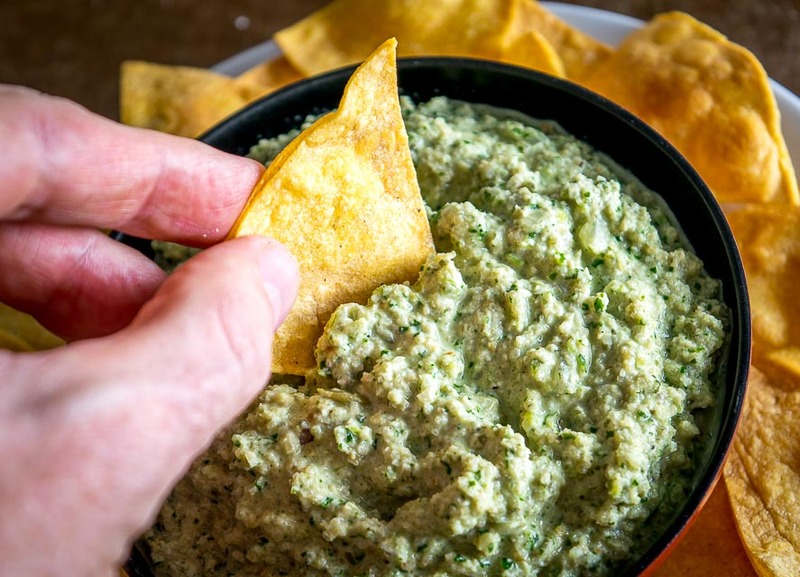 You could also use these ingredients to make a Pepita Dip. Or a simple batch of Spicy Roasted Pepitas. I’m a native Texan and I literally love your site. It is definitely one of the best on the internet. Your sauces are fantastic. We made this tonight and it is great. Confession time I took some of the green mole and added an avocado to it along with some store bought hatch green pepper sauce, oh me! Great recipe, keep up the good work! Thanks Ronnie for the feedback! Those sound like great adjustments, especially using the Hatch — some peeps will use poblanos in their Green Mole and I hope to experiment with something similar in the future. Cheers. Because of osmosis, water goes from the chicken to the salt water. Water will move through a membrane, towards the side with the highest concentration of solutes (salt in this case). In other words, you are drying out the chicken, not the other way around. This is delicious. I forgot the spinach and we loved it. Will try the spinach next time. One suggestion. I did not process the Pepitas to a fine powder, so the mole was gritty. Will try that next time. Thanks James, so glad you guys liked it!